Providing on-site service with 20 years of experience! 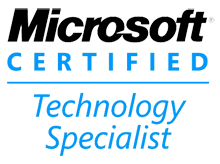 Microsoft and CompTIA trained and certified! Exceptional with Exchange Server, Active Directory, Security, Group Policy, Server and Client Implementation. Quick reponse times for all business needs. Proper design for proper Implementation. Multitasking abillities to quickly service all issues in a timely manner. Keeping up to date with the newest technologies is part of the job.